Hole 10 is the beginning of why we call our course, Shade Mountain. The green is reachable for everyone with a second shot but if you hook or slice you'll be playing in the shade of lots of trees. 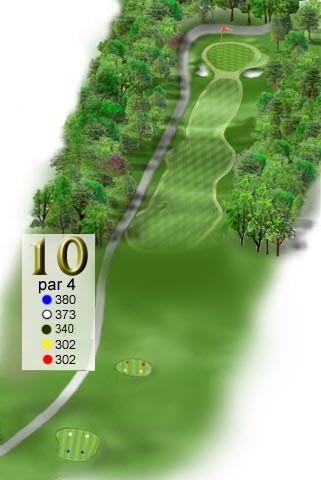 The 10 hole is straight ahead slightly uphill. The green is protected by two green side bunkers, one to either side. If your ball does go into the trees 'woods', not only will the trees come into play but also lots of mountain stones.